Emilie Autumn is an amazing singer-songwriter who has turned dark times into performance; who has in fact built a fantastical persona and entertaining stage act under the asylum for wayward Victorian girls motif. Her most recent album, Fight Like A Girl, took the bold step of turning institutionalisation into a musical where independence — girl power — wins out over patriarchal straight jackets. And more power to her. Such a themed, narrative album was to be applauded. But it hasn’t translated to her latest Flag stage show, which doesn’t quite know what it wants to be. With a surprisingly unadorned stage compared to her previous — and sensational — visit to St KIlda’s Espy, with songs interrupted by burlesque, a quaint fan fic skit and the once amusing, now, quite frankly, past its time, rat game, in which offside Veronica pashes an audience member to give the crowd a lesbo thrill, the show lacked cohesion. The sound wasn’t great, either, the whole gig set to a backing track that often overwhelmed the at-times patchy vocals. There were highlights as songs such as ‘Fight Like a Girl’ blasted out, and signs of what the show could’ve been when the always entertaining Captain Maggot, under-used, stalked Emilie in demonic garb on stilts. Emilie is perhaps trapped at the moment, between wanting to break out her artistic vision but feeling compelled to play to her fan base — there’s a great deal of audience support for the rat game, for instance. Will her fans go with her if she leaves the asylum? Will they accompany her on a journey past the dalliance with madness and teasing sexuality? It will be interesting to see what direction Emilie takes next, but I hope the next stage show flies a different flag. We ducked into Irish Murphy’s to escape the antarctic gale sweeping down Ballarat’s Sturt Street last night, and what a warm encounter it turned out to be. Through the swinging doors of the airlock, through the public bar and into the restaurant, where the staff were welcoming indeed. 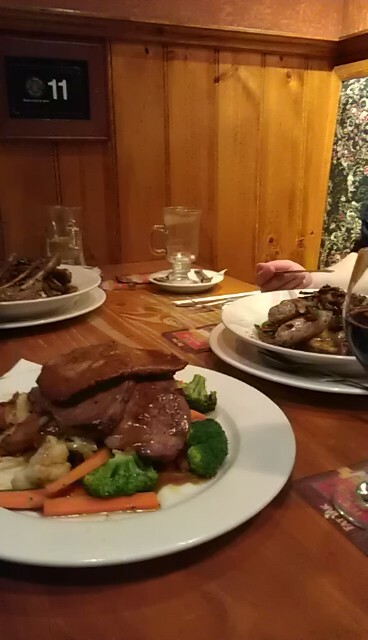 Tucked into a cosy booth, we enjoyed an early dinner: lamb shanks ($25), bangers and mash ($20), and for me, roast beef with veg ($21). Massive serves — dessert was just never going to happen. Tasty tucker. And while the strips of beef were a little chewy, the roast taters were the best I’ve had in eons. I was only half joking when I said next time I’d be ordering just a plate of them! Washed down with a glass of Pepperjack shiraz: spot on for a blustery day. Old signs and display windows of bottles add to the brick-n-timber ambience. Getting there early was a bonus. 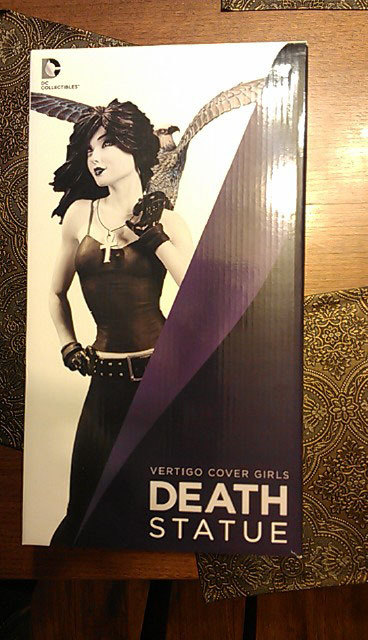 Earlier, guided by a friend, our trip to town netted a joint housewarming present to ourselves: an absolutely stunning figure of Death, from Neil Gaiman’s Sandman books. Safe to say, we’ll be back to visit the wonderfully laid out Heroes HQ comic shop, occupying the rooms of a building forming part of a former military base. So far, Ballaratia: all good! Very pleased to see Salvage among the six nominations for best novel of 2012 in the Ditmar Awards. The awards are popularly nominated and voted upon, so perhaps can be seen more as a measure of awareness within fandom, which makes the listing very cool. Salvage and Blood and Dust are both finalists for best horror novel in the Aurealis Awards, and Blood and Dust is up for best novel in the Australian Shadows, so the Ditmar nom balances the books nicely! 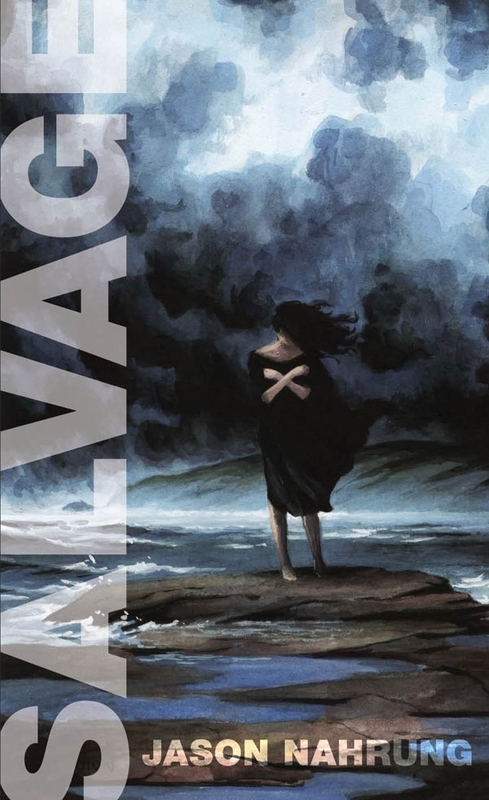 There was a little confusion with Salvage, due its word count being precariously balanced on the cut-off 40,000-word mark between novella and novel. My fault, really: I should’ve got a final-version count from the publisher rather than going off an earlier version. We’re talking a difference of one or two sentences, but enough to tip it over into novel territory. Also up for the Ditmar is a star-studded field, including Kirstyn’s Perfections — also a finalist in Aurealis and Shadows. In the same week that the Aurealis Awards listed Blood and Dust and Kirstyn’s Perfections as finalists for best horror novel of 2012, lightning has struck twice: both books were announced last night as finalists for the Australian Shadows best horror novel. This time, the pair is keeping company with Lee Battersby‘s Corpse Rat King. That short-list of three is overshadowed by the short fiction award finalists — eight of ’em! That’s a long short-list! I blame Kaaron Warren, who has not only three of the four yarns in her Through Splintered Walls collection listed there, but the fourth in long fiction (kind of a middle ground between short and novel) AND the collection itself. Pretty awesome, huh? Here’s the full list, with winners to be announced on April 12. Salvage, and Blood and Dust, finalists in the Aurealis Awards! Happy dancing here in the shadow of Wendouree Tor with the word that both Salvage and Blood and Dust are finalists for the Aurealis Awards’ best horror novel of 2012, AND Kirstyn’s Perfections is also in the running! Yes, we’re going head to head! This is my first short-listing in the AAs — The Darkness Within was highly commended in a year when there was no short-list — so it’s a hell of a thrill to have two, quite disparate titles listed. The fourth book in the finalists’ list is by fellow Victorian Jason Franks, who I met earlier this year at Oz Horror Con. He’s very cool and very passionate about his craft, so I’m looking forward to tracking down his Bloody Waters — it’s his first novel, following some well-received graphic novels. Nice, eh? Indeed, the Aurealis finalists make for an excellent recommended reading list. Another thrill is to see other writers by my publishers Xoum and Twelfth Planet Press making an impression on the lists. And check out the science fiction novel section — SIX titles in a category usually a bit light on, and offering a whole lot of variety. Interesting, too, to see self-published works making the short-lists, and the number of multiple nominations — Margo Lanagan, Jonathan Strahan, Jo Anderton and Kaaron Warren in the thick of it, amongst others. Wow, it’s a quality field all over. Congratulations, y’all! The awards will be presented in Sydney on May 18. While I was offline… and OMG look at all the Conflux book launches! Sean the Bookonaut has been blogging up a storm. Viz, an examination of Grimdark — a category of genre coding I hadn’t even heard of. Lisa L Hannett has had a new essay published at This Is Horror, calling for a consideration of less used/abused things that go bump in the night, which in turn leads to an essay from James Bradley about the ever-evolving vampire metaphor. Random House is taken to task for onerous conditions in its digital imprint Hydra, and makes amends, as reported by Locus. A Brissie launch on April 9 for Charlotte Nash’s debut novel Ryders Ridge. Dymocks ends its publishing effort, D Publishing, perhaps on the nose from the get-go due to a roundly criticised contract base. Margo Lanagan makes the long list of the Stella Prize with Sea Hearts. And I’ve sifted the program for Conflux next month to find the book launches — hold onto your hats! I’m not sure if it counts as a launch, but Angry Robot (whose supremo Marc Gascoigne is a guest of honour at the con) is having ‘an hour’ from 1.30pm on the Sunday. Angry Robot is chockers with Aussie writers (Kaaron Warren, Jo Anderton, Trent Jamieson, Lee Battersby …) so it’ll be bookish, whatever it is. Now that was fun! 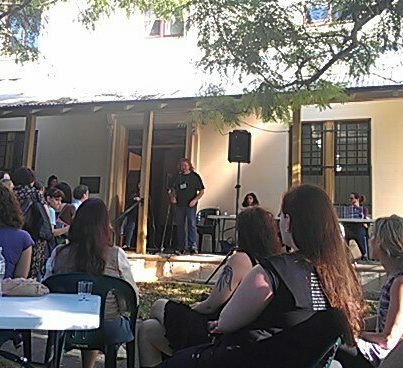 The NSW Writers Centre held its sold-out Speculative Fiction Festival on Saturday, and it was one of the most relaxing, enjoyable, informative literary events I’ve been to. Kate Forsyth curated the event, gathering writers and publishers from as far away as Perth: Garth Nix, Juliet Marillier (launching a collection, Prickle Moon, which sounds fab and has — awesomely — a hedgehog on the cover), Ian Irvine, Richard Harland, Alison Croggon, Adelaideans Lisa Hannett and Ben Chandler, Angela Slatter, Rob Hood and Cat Sparks and Deb Biancotti and more and more. Sadly, Kim Wilkins and Marianne de Pierres were unable to attend. The centre itself is housed in a gorgeous old building, two stories, a former asylum and, I’m told, the building in which shock therapy once occurred. 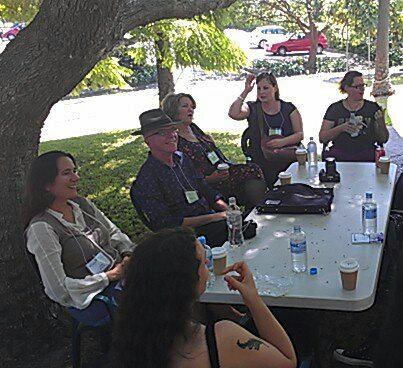 No such shocks at the fest, but plenty of stimulation: publishing insights from the likes of Joel Naoum (Momentum) and Zoe Walton (Random House) as well as conversation about writing fantasy and YA and using fairy tales and, of course, getting published. Sydney turned on a warm day with a cool breeze, and lunch and coffee on the lawn under the shade of the jacarandas was a delight. Gotta love those crows, chiming in with their own comments from time to time. Chrissi and Amber from Galaxy Bookshop kept an eye on the stock, and the centre’s Rose Powell was a butterfly of biz keeping everything in order — she certainly deserved a drink as the book launch got underway on the veranda at the end of the day. 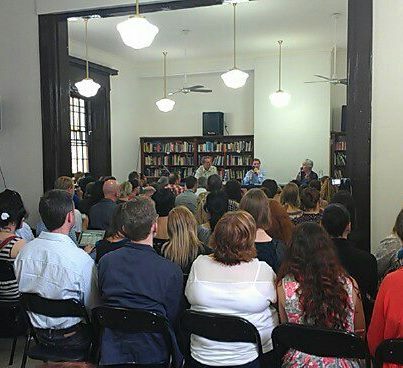 Kirstyn and I sat on a panel with Rob Hood and Deb Biancotti about horror and the weird and had a jolly old time talking Gothic and psychology and chills to a room surprisingly full for a dark side discussion; the interest was heart warming and the audience engaged. As always, half the fun is the chinwagging, and with the likes of Alan Baxter and Mark Webb and Zena Shapter and Rivqa Rafael and Angie Rega (who has a new website! and new stories coming out!) and oodles more, there was plenty of chinwagging to be had, both there and at the pub afterwards. Addendum: Pix by Cat Sparks! Throw in a Manly ferry trip the night before to attend the launch of Kate’s The Wild Girl (review here by Sean, my go-to blogger for all things spec fic)and dinner after, and fair to say the weekend away was a delight. Next up: Newcastle Writers Festival and the ever-enjoyable Conflux.